Continuing my tour of Sichuan dishes brings me to a traditional Sichuanese noodle dish that used to be a common street food. I love to sample street foods wherever I go — Hong Kong, for example. (Well, not street hot dogs or hamburgers in Britain, but that's self-preservation.) But street foods, in general, are fun and filling and cheap, and I really love the variety and getting to try this or that tidbit. Dan Dan Noodles are named after the bamboo shoulder pole (dan) that the street vendors used to carry their stoves, noodles, and secret sauces. There's no one original "dan dan noodles," but Dunlop says that the name has come to be associated with the recipe below. Perhaps in Sichuan that's the case, though in U.S. Chinese restaurants you're more likely to find a version that uses a peanut-sesame sauce (perhaps with cucumbers). So if you're familiar with the sesame-peanut version, this one will be quite a contrast. The ya cai is perhaps the most intimidating ingredient in this recipe for Westerners. Asian grocery stores have shelves full of a dizzying array of pickled vegetables, and it's hard to know which kind is the right one to use. You can't go wrong with mustard greens. Look for air-tight sealed plastic bags of preserved mustard greens. These need to be chopped and then cooked before eating. Or you can get small jars of pickled chopped mustard greens, which are ready-to-eat and can even be served over plain rice as a snack if you're into that kind of thing. Heat 1 Tbs of peanut oil in wok over high flame. Add the ya cai and stir-fry for about 20 seconds, until it is fragrant. Set aside. Add another Tbs of oil to wok and reheat, then add the pork and stir-fry. As the meat separates, splash in the wine. Add the soy sauce and salt to taste, and continue to stir-fry until the meat is well-cooked but not too dry. Remove from the wok and set aside. Put stir-fried ya cai and other sauce ingredients into a serving bowl and mix. Cook noodles according to the instructions on the package. Then drain and add them to the sauce. Sprinkle with the pork and serve immediately. If serving from a big bowl, mix sauce and noodles and meat until evenly distributed. Otherwise, assemble each portion in individual serving bowls and allow people to mix their own. Chinese cooking, I have to ask....did you take those photos? and where did you get the beautiful bowls and chopsticks? I've been lurking for a bit now and must say as a fellow Michigander (just outside AA) I love your site. tkn: Thanks! I'm glad you like my site. Yes, I took the photos. We've had the bowls and chopsticks featured in the last few posts for years, so I couldn't say where we got them. But you can find all sorts of beautiful bowls and plates and chopsticks at most Asian grocery stores. Hua Xing has a very large assortment of plateware. Tsai Grocery also has a nice selection. Yum! Did you notice that Dan Dan Noodles are listed on the Food & Wine's 100 Tastes to Try in 2007? I'm working on the entire list and I have a recipe from their website. Ah. We just got back from Mantattan, where we discovered the Szechuan Gourmet, on 39th in Midtown, one of those places that's so authentic you wouldn't dare order half the things on the menu (stir-fried duck tongues and so forth). The recommendation on one of the local food boards about the place that made us go was, "Order the dan-dan mein, they're like eating electricity!" and indeed, they were gloriously, excruciatingly hot -- and there was no sesame paste. This looks like it may be a close approximation (with a notable increase in chili oil). Thanks much. "so authentic you wouldn't dare order half the things on the menu (stir-fried duck tongues and so forth)"
I'm a former Ann Arborite and Chinese food fanatic. 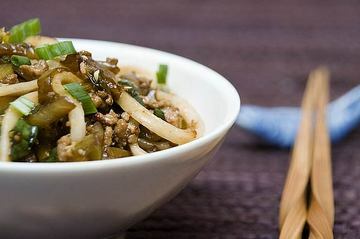 Believe it or not, you can find authentic Szechuan cuisine in Ann Arbor at Middle Kingdom on Main Street of all places. Their chef is Szechuan and they have a special "secret chinese" menu...no english translations. On that menu is a whole slew of authentic Szechuan dises, including, believe it or not, stir fried duck tongue! Yes, I ate it, it is real in Ann Arbor. No way. We knew about the multiple menus (the green one for civilians, the red one for authentic HK Chinese, and the one just in Chinese). But I had no clue there were Sichuan dishes on there. Thank you so much for posting a dan dan mien recipe without sesame paste or peanut butter!! I was chasing a childhood memory of eating dan dan mien in Taiwan KNOWING that there was no sesame or peanut butter, but such as recipe was hard to find in the states. Both the article and comments are so useful to me. I also have two bottles of black vinegar for exactly the same reason and I have a package of preserved mustard greens. I wanted to make the dan dan noodle recipe mentioned in Food and Wine, but never found the sesame paste. Now I know I don't need it and have other uses for the black vinegar. This is a great site. Btw, I wonder how long those mustard greens keep unopened and refrigerated? I've had them quite awhile. First, dandan mian is a Szechwan street food and did not originally include pork, but did include sesame paste. Each portion of noodles were doled out separately as were the condiments: sesame paste, soy sauce, hot peppers (or hot pepper flakes in oil), scallions, raw garlic and ginger. The addition of pork or peanuts or preserved vegetable are merely variations on the original. Delicious variations, but variations none the less. I had read Fushica Dunlop's book- Shark Fin Soup- it had the same recipe as you mentioned...but never tried it. I shall be trying it out tonight...dont have the preserved greens, so I'll prob use some spinach or mushroom...shall let you know how it turns out! If you ever come down to Georgia, in Marietta, there is a restaurant named Tasty China. You will love this! Even after stuffing myself, I always get a carry out of dan dan noodles to go. But if you go, order: hot and numbing beef rolls (don't drink water after this. ), Shan City chicken (no bone... and you have to say no bone LOL) and the deep fried eggplant. The serving is huge and scattered with Sichuan peppercorns and other dried chili peppers. Now I'm wishing I lived in GA again. But with your recipe, I can rule my kitchen with my other Asian recipes. If you love Indian food, my crock pot will never be the same w/ all of the delicious Indian stews I have made it in. Mmmm Nihari! I've actually been to Tasty China, and it was really good. I tried the rolls, and (I think) the Shan City chicken.